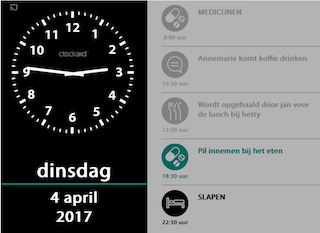 Clockaid DayView shows the time, date and weather. It comes with the calendar, alerts and the online calendar control function. The additional DayView view gives a clear day event summary. Buy the product key through the 'order buttons' shown below. Follow the instructions send to you by email. Download the free app on the tablet dedicated for Clockaid. Open the app and click "Upgrade". iPad users choose here for 'Activate'. Then enter and key code.